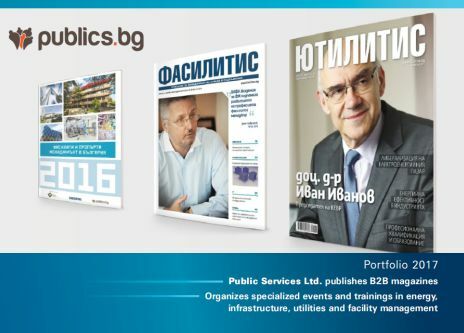 "Utilities" Magazine is the first and only established monthly B2B magazine in Bulgaria, which covers topics, related to management of utility companies in sectors as: infrastructure, energy production and trading, water sector, heating, telecommunications, asset management, legal and regulatory framework, etc. From 2003 to 2012 the magazine was published by Uconomics Ltd. The magazine is leader in covering the main topics of the Via Expo conferences - environment, waste management, renewables (incl. biomass & biogas), and Smart Utilities solutions. Please see here more information about our projects - publications and events, as well as about our 2017 offers.